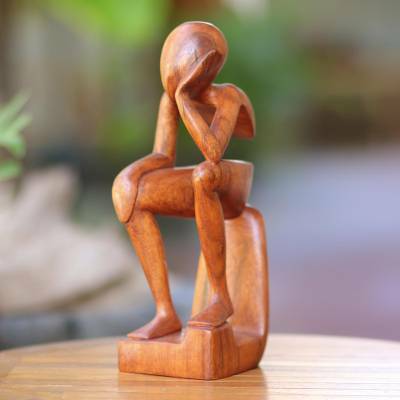 Fair Trade Thinking Sculpture, "Pensive I"
Absorbed in thought regardless of time, a “Pensive” state is well captured by Nyoman Karsa's sensitive talent. Karsa hand-carves this piece from suar wood, its evolving grain mirroring the rumination of thought. Smooth textures and flowing contours seem unaware of the space within the body thus becoming an integral part of the statuette. A marvel of carved artistry ideal for the intellectual setting. As a fan of the "The Thinker" sculpture I purchased this. Simple yet impressive piece.